Tag line: "What did he hide behind his painted smile?" 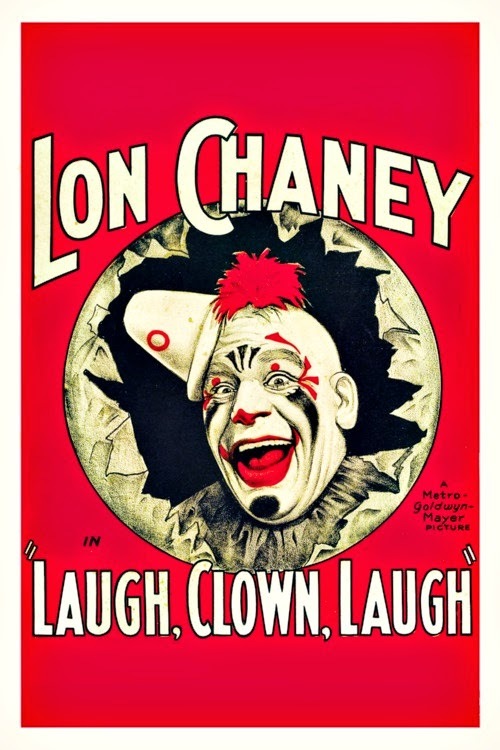 The depth of feeling that Lon Chaney conveys in the 1928 drama Laugh, Clown, Laugh is truly astonishing. Able to break your heart with a quick glance or a nod of his head, Chaney proves here that he was more than a great actor; he was the perfect silent screen star. Tito (Chaney) and his brother Simon (Bernard Siegel) are circus performers who travel the Italian countryside. During one of their many stops, Tito finds an abandoned young girl sitting by the side of a river and decides to adopt her as his own, giving her the name Simonetta (after his brother). Ten years later, Simonetta (Loretta Young) has grown into a beautiful woman, and Tito, now a famous circus clown, discovers that his paternal love for the girl has developed into something much more substantial. To further complicate matters, Simonetta meets Count Luigi Lavelli (Nils Asther), a handsome young man with whom she eventually strikes up a romance. Despite being able to make hundreds of people laugh with his antics, Tito himself is an emotional wreck, convinced that he’s lost Simonetta for good. But when she instead chooses him over the Count, Tito, at first elated, soon realizes he’s standing in the way of young love, forcing him to take drastic measures to ensure Simonetta and Luigi will live happily ever after. Though once again playing a character whose unrequited love drives him to despair (much like he did in Phantom of the Opera, The Hunchback of Notre Dame, and The Unknown), Chaney also gets a few chances in Laugh, Clown, Laugh to bring a smile to our face, demonstrating his skills at pantomime and physical comedy whenever he’s in full clown make-up (the scenes where he and Simon perform their circus act are a lot of fun to watch). Alas, Tito’s smile never lasts long, and the sadness that envelops the character is, at times, almost too much to bear. In one of the film’s most poignant sequences, Tito, having just wowed another audience with his act, rushes off-stage to find the Count and Simonetta in a loving embrace. His heart suddenly broken, he can barely bring himself to acknowledge the crowd’s applause with a curtain call. The ease with which Chaney makes us laugh one minute and cry the next is nothing short of amazing. It’s somehow fitting that Lon Chaney spent the majority of his career in silent films (his lone sound picture was a remake of his earlier movie The Unholy Three). A master at expressing emotions with his eyes, his face, and his mannerisms, words would have only gotten in his way.